If you watch ABC’s World News with Charles Gibson, Blue’s Cafe is a place you may actually heard of. A few weeks ago (September 18 to be exact) Barbara Pinto showed up in Kankakee to do a Wall Street vs. Main St. story. 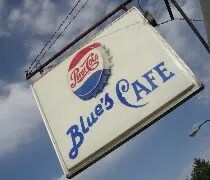 Blue’s Cafe was one of the places she visited to get the “regular Joe” insight into the financial crisis. Finding places to eat in the Kankakee area has always been tough for me. Growing up, my parents always hit the chains. We didn’t really go out of our way looking for local restaurants. I’m back in the Kankakee area this week because my brother and his wife are having a baby. Their first and my parents first grandchild. Because it was everyone’s first, my parents and my sister-in-laws parents were at the hospital bright and early this morning. I didn’t get up and get going until lunch time. The hospital is a half hour away so once I was in Kankakee, I wasn’t going home until I had a niece. I got to the hospital around 11 and started trying to convince everyone to go to lunch with me. I got no takers, but did get some good suggestions. 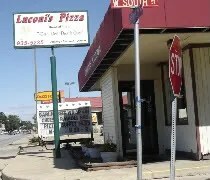 My sister-in-law’s parents suggested a few places including Luconi’s. They raved about the pizza, but also couldn’t stop talking about the hamburger. Sounds good to me. I do love me some burgers.